We were delighted that Class 5/6YW were able to join pupils from other York schools on a visit to the National Science, Technology, Engineering and Maths Learning Centre at the University of York to hear Dallas Campbell – TV science presenter talk about his experiences working with astronaut Tim Peak. MORE than 100 pupils and teachers from York schools attended a special event in the city. 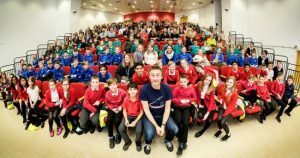 The National STEM Learning Centre at the University of York, which encourages young people to find out more about science, technology, engineering and mathematics, hosted the event, which included a keynote speech from TV presenter Dallas Campbell. Dallas, who presents TV science shows and recently published his first book about space travel, brought a space suit similar to the one British astronaut Tim Peak wore on the International Space Station, and discussed the qualities needed to become an astronaut and the future of space exploration with attendees. Dallas took questions from the children and talked with teachers, many of whom had been awarded the Space Education Quality Mark – an award given to schools and colleges that have shown significant use of the context of space in subjects or shared resources and used space to improve their curriculum.